Automotive cleaning and detailing service at affordable cost from comfort of your home. 1. Steam cleaners produce low water content steam that evaporates faster than regular upholstery wash. Meaning you will be up and ready to drive almost immediately after cleaning. 2. Steam is the best solution to clean any hard surfaces as well as water sensitive areas like leather and cloth upholstery. Steam helps to condition and revitalize leather back to its original state. 3. Easily access hard to clean areas like cup-holders and pockets without breaking your fingers. Simply steam the area and wipe dry with a fiber-cloth. ​4. Safely clean and disinfect steering wheel and console on a low steam setting, as well as clean the air vents, knobs and all other hard to reach areas and seams. 5. Allows you to kill on touch all pollutants and allergens within your vehicle’s ventilation system. Briefly steam the vents on high-pressure setting, as recommended by various allergy associations. 6. Our 220v Carmen Inox machines are capable to clean both – interior and exterior of the vehicles. A powerful combination of steam and vacuum allowing you to fight salt tracked into the carpets and upholstery, stains from food and drinks, as well as any other mess left by pets and kids. 7. Steam immediately dissolves tree sap, bird and animal droppings, bugs and grease from your vehicle exterior. Cleans even the toughest stains like brake dust, exhaust pipes of diesel vehicles, underhood oil and engine liquids stains. 8. Steaming provides eco-friendly approach to car wash as it uses on average 10-15 times less water that a standard car wash. Best part is – it’s all chemical free and safe for you and the world around you. The power and mobility of Dupray steam cleaners that we use makes them perfect for cleaning the interior, exterior and carpets of automobiles. Our steam cleaners reach some of the highest temperatures and pressures in the industry – up to 345°F / 175°C and 121 psi / 8 bar. All our Dupray steam cleaners come with a complete set of multiple accessories which allows you to steam every inch of your automobile but also completely detail and restore RVs, boats, buses, and motorcycles like never before! Steam cleaning is ideal for detailing, as it is the safest, most efficient and environmentally friendly way to clean. The Carmen Super Inox™ commercial steam cleaner on 220V is the perfect tool for interior and exterior car detailing. 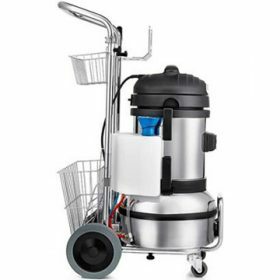 It produces steam temperatures up to 356°F / 180°C and comes fully equipped with a built-in wet/dry vacuum system to extract residue and detergent injection to dissolve even the most stubborn dirt and grease.